This is a (hand--solderable) breakout board for STM32 ARM MCUs in LQFP-48 package. I mainly had in mind STM32L052CxTx (for low power applications) and STM32F072CxTx (for USB applications). From rev3 up, it can also support the ubiquitous STM32F103CxT6. The design files and documentation are freely available (here). Tested with L052, F072 and F103. Notice: I'm selling some assembled boards on Tindie. The point of this board is to have a teensy-sized breakout for USB capable STM32 chips, suitable for very low power applications (e.g. a battery powered sensor). UPDATE: I've made an "add-on" board for this breakout, namely to turn it into a SerPlus board: USB-CDC-input and standard 6 pin UART output, used either as a basic USB-to-serial converter, or as an "telnet-enhanced" convenient communicator with e.g. Jeenode Zero. It's semi--documented in this post. I tested the boards with STM32F072CBT6 (128Kbytes of flash, 16Kbytes of RAM, built-in DFU bootloader), with STM32L052C8T7 (64Kbytes of flash, 16Kbytes of RAM, very low power states) and with the ubiquitous STM32F103C8T6. The L052 and F103 only have an USART bootloader built-in (for more about this see below). I have no plans at the moment to support these through Arduino (although if there will be a reasonably mature STM32 add-on, then it should be simple to add these). JCW at Jeelabs also has an L052 board, the Jeenode Zero, for sale here. This one has a RFM69CW radio on board, as well as a socket for a CR2032 coin cell. Yummy! No USB though. It runs forth! Forth is also supported on the bat boards; for the moment only through USART and not USB though. I will update this page with links to code when it is ready. These are the easiest to use with this board. None of the "optional" components are required, and no external hardware is needed even initially, thanks to the DFU bootloader. These are the main target of this board, for low-power prototyping and sensors. None of the "optional" components are required. Because these don't have DFU bootloader built in (more on this below), either an UART (USB-to-serial board or something like that) with 3.3V logic level, or a SWD debugger (JLink, ST Link V2, Black Magic Probe, ...) is required to get started after soldering the board. These are used in a variety of STM32 boards available (including the $2 "blue pill" boards on ebay from China). If one wants to use USB (and clock them higher than 48MHz), the external high speed crystal is needed (there's a footprint for this on the bottom side of the board, plus the accompanying capacitors). Furthermore, this chip does not have an internal pull-up on the D+ line (to signal the computer that an USB device has appeared). Hence this requires an external circuitry (usually implemented with a transistor and some passives); this board offers one of the simplest solutions, namely a footprint for a resistor from D+ to a GPIO pin (PB7). Finally, the pin used for LED on this board (PA15), is assigned to one of the JTAG functions by default (this causes the LED to light up slightly by default; e.g. when in the bootloader mode). Hence, to use the LED, one should disable JTAG (debugging is still possible through SWD). This is done by enabling RCC_AFIO clock, and setting the appropriate SWJ_CFG bits in the AFIO_MAPR register. If the desired outcome is to disable JTAG, leave SWD enabled and AFIO_MAPR is in its default state, this can be achieved with "AFIO_MAPR |= (1<<25);" in C.
When the second onboard button is connected to the BOOT0 pin on the chip (it is by default), holding this button while resetting (or powering up) the board will force the MCU to enter the built-in bootloader. On both F072 and L052 there is an USART bootloader, listening on PA9(TX) and PA10(RX) - the two pins right next to the power pins on the 'top' of the board (and usually some more options, like the other USART, I2C or SPI). Loading firmware using this bootloader (e.g. using stm32flash) will always work, regardless of the current firmware. Another way to load firmware onto the board is to use the SWD pins. These are on the short side opposite to USB, and of course they can be used for debugging as well. Finally, the F072 MCU also has a USB DFU bootloader built in, meaning that pressing the BOOT pin and resetting the board, while connected to USB will activate this DFU bootloader. Then the firmware can be uploaded e.g. with dfu-util. The L052 however does not have a DFU bootloader built in. So I modified the bootloader used by the BMP folks to run on L052 as well. It occupies the first 8Kbytes of flash, and hence expects the firmware to begin at address 0x8002000. (One of the first instructions in the firmware should be to relocate the vector table to this address.) This bootloader is entered by connecting PB3 to GND (so e.g. by putting a jumper across the two pins at the edge of the board) when resetting/powering up. See Usage/Examples for downloads. Of course to put it on a fresh board, you'll need to use the USART bootloader (with some USB-to-serial board, there are oh so many on ebay for $1), or load the firmware through SWD (with some SWD debugger, e.g. STlink, there are oh so many on ebay for $3). A few examples of C code using libopencm3 are in my public repo. The sources show the code differences needed for different MCUs, it's done using #ifs in the sources. Some of the above (including the L052 bootloader) can be downloaded here, compiled into a binary firmware. It tends to fail for me without an erase first, hence the -e 255 parameter. on L052 with the bootloader described above. I use a jlink clone; for STlink V2 change jlink to stlink-v2 and swd to hla_swd. For F072 boards, change CHIPNAME, stm32f0.cfg. You can also play with WORKAREASIZE (0x4000?). Run openocd as openocd -f config_file.cfg. Connecting to it from arm-none-eabi-gdb is as usual, telling gdb target extended-remote :3333. The usual commands should then work, e.g. run, load (if you passed an elf of the firmware to gdb), etc... I personally like using something on top of the bare gdb, to make the navigation around the sources easier. I use cgdb. If you have STlink V2, instead of openocd you can also use st-util. Connect to it from arm-none-eabi-gdb with target extended-remote :4242. For the record, the command to read flash from the MCU to disk (e.g. for a backup of a running firmware) is dump ihex memory FILE 0x8000000 0x8008000, where ihex can be also binary and the last number is 0x8000000 plus flash size (in hex here). 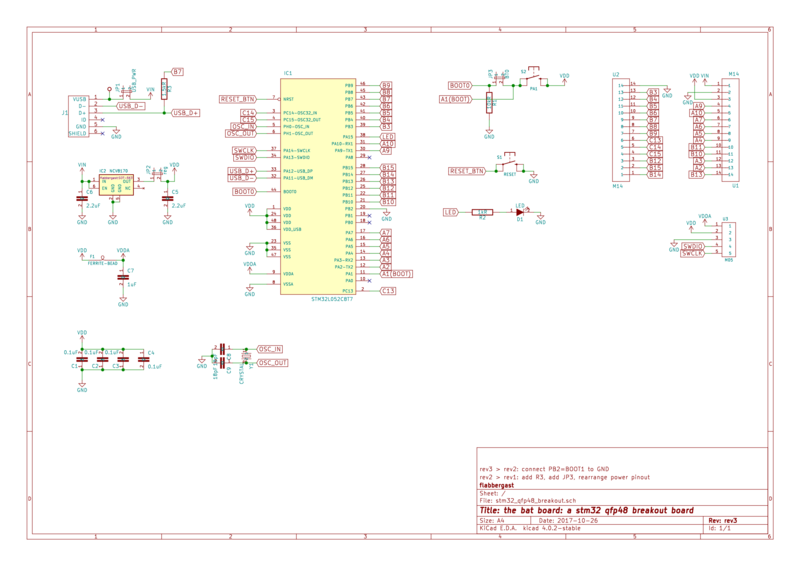 An ascii version of the pinout (rev2 and up). The alternate functions are those that are marked on the bottom silkscreen on the PCB, but naturally the MCU has usually more functions on those pins than just the one I marked. The pushbuttons that work are for instance these on farnell, the crystal has this footprint. The micro USB connector has 2 through holes. Note: if you are fitting the ferrite bead, you need to cut the trace in its footprint before soldering it! C5, C6 are there to stabilise the regulator and C5 also to smooth out any power drain spikes by the MCU or other stuff supplied by the board's 3V3. The NCV8170 is stable already with 1uF caps. R1 is the pulldown on the BOOT0 pin (so 10-50kOhm range is probably OK). R2 is current limiting resistor for the LED, so go with whatever your LED allows (and fiddle with the brightness). C1-C4 are filtering caps for the MCU. It is quite possible that the MCU will run reasonably stably even without those, especially on lower clock speeds. rev1 -> rev2: Added the option for a pullup resistor on D+ and solder jumper to disconnect the button from BOOT0. Modified pinout to be power compatible with Teensy 3.x, so that power/charger boards for teensy can be used with here. rev2 -> rev3: Connected PB2 (BOOT1 pin) to ground. This is only for the M3 and higher MCUs to have a predictable bootloader behaviour. No effect for the M0 MCUs. This was certainly inspired by the Teensies and MCHCK.